In 1962, Prof. Rogers, along with two other original collaborators, was studying how new practices spread among farmers in the US Midwest, not how, say, a new model of harvester found its market. In other words, they were studying what people do, not what people buy. Does it matter? Consider the 1995 Netscape IPO, which started the dot.com bubble. The World Wide Web was a genuine innovation — a new way of doing things (building on existing technology) — and by 1995, it was clear that the Web was going to be important. However, people confused Netscape’s browser (a specific product) with the Web itself (an innovation), and assumed that by investing in the company that made the browser, they were investing in the Web. However, the two were not inseparable — Netscape’s browser tanked, while the idea of the Web grew stronger and stronger. Later, investors would pump up Apple’s and Facebook’s stock in a similar way, assuming that by doing so, they were investing in the innovations of mobile computing and social networking. Apple in particular has been able to deliver revenue to justify some of its stock price, but as it loses more and more of the smartphone and tablet market to Android manufacturers, the difference between innovation (mobile computing) and product (iPhone/iPad) becomes very clear. 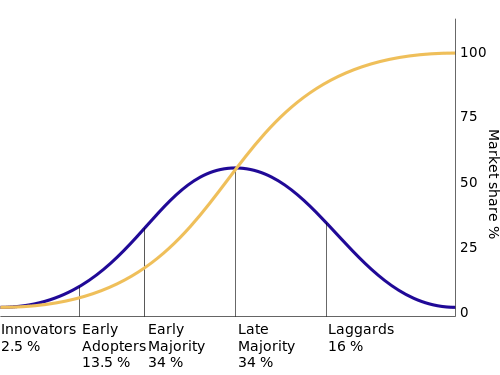 Despite all that, most of the time I see people using Rogers’ curve, they’re using it for a specific product, project, or initiative, not for new ideas or practices. Does it make sense in that context, or are we being as lazy and confused as the 1995 Netscape investors? Rogers based his 1962 book on over 500 studies of how ideas spread; it would be interesting to see if there’s similar research to back the claims of over-eager sales VPs and project managers. 2 Responses to The diffusion of innovations, or of products? Fully agree you have a very good point David. Not sure it’s captured by the terms you use, and there certainly is a clear curve around adoption of a new product, as seen generally by sales figures. It’s likely a bell curve too, but so too are so many natural things. IMHO the first is closer to capturing the idea, but I can’t better it in a phrase. Thanks, Dave. I’m not sure I have the right words yet, either, but I’m glad you were able to understand what I was trying to write.